If you haven’t noticed, we here at Gears of Eden like to play it pretty close to the chest in regard to story. Oh sure, we’ll tell you all about mechanics and programming, and we’re more than happy to show off art, so long as it doesn’t give away too much! But the story? That’s ours to keep until we have to show it off. That said, there’s a lot more to a writer’s job than just story, so we had an idea. Since so much of the development talk right now is behind the scenes work, we decided that it’d be fun to spend the next couple weeks talking about things from a writer’s perspective! Before that though, a quick update on the our development in this … Dev Update. Makes sense, right? Last week, we finished setting up the authentication system so that you’re able to login without any hassle beyond the input of a valid email/code combination! We’ve moved on from that to start putting in place the data collection system to ensure that this alpha is as beneficial for us as possible. In addition, we’ve just today added a page on the website for you to submit specific issues (bug reports) — but there’ll be more on that in the future! As far as player-facing updates, we’ve been tweaking the camera system to make it feel more natural and better avoid obstacles, and we’ve also been working on a pesky issue with the rover being far too easily flipped. 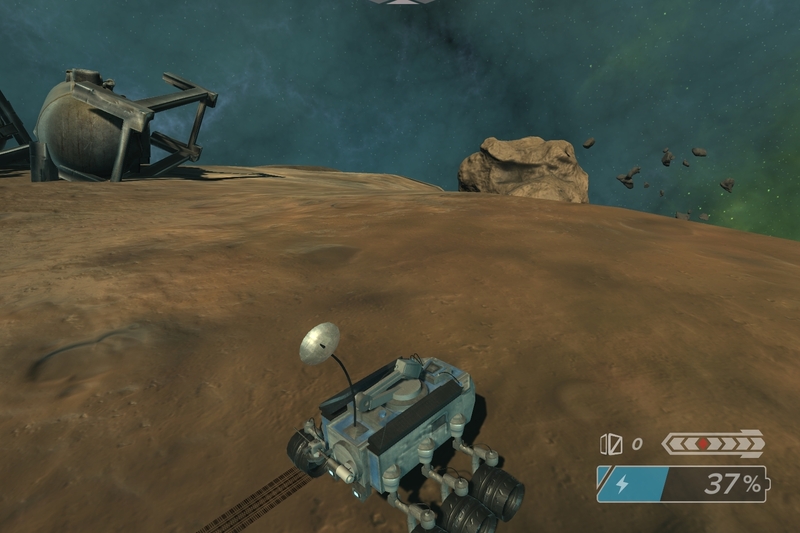 This will eventually include a method of righting a fallen rover, but we want to make sure that you don’t need to use it too often. But that’s not writing, is it? Well this week, we’re taking preliminary steps to accomplish one of our loftier goals: we want to make sure that the player has many options for when they’re playing and that they’re all engaging. That last part is where it gets tricky. If you’ve played Stardew Valley, you’ve probably noticed that at any moment, you have the freedom to drop what you’re doing and go play somewhere else, be it fighting in the mines, fishing at one of the many fishing spots, or even hanging out in town and giving out presents. You can even play a game within the game! What makes this work is that everything feels connected to the story and everything feels alive. You’re not just capturing an outpost to get Empire Points so that you can buy a cool mount, you’re growing a crop because you know that Linus loves yams! Linus is so nice, why wouldn’t you grow him some yams? Naturally, we would love to incorporate this type of openness, but Stardew Valley makes it look way easier than it is. It involves a lot of game design logic, a lot of writing skill, and a whole lot of hard work. It’s accomplished by a bunch of small pieces working in tandem that, individually, might even seem insignificant. In the case of this week? We have been working to make sure that the player is able to mine and collect ore to their heart’s content without it ever feeling too “quiet.” We’re investigating the sorts of mechanics, both from a player perspective and a character perspective, that we can use as an inspiration for dialogue to let the experience of the game feel as alive as it should be. We’re also investigating the character you play as. This character will be important to its world, and it’s important to us that the way this character speaks reflects who it is and its experience. This is a small step, but it’s a necessary one. This writing discussion was more about our inspirations though, wasn’t it? It didn’t allow for much time in the nitty gritty that we so commonly engage with here at the Dev Update. No, that’s reserved for next week! I know I say this every week, but if you’re at all curious about how writing can come to life over the course of a game’s development, be sure to follow us on Twitter and Facebook so you can see that Dev Update the very moment it’s available! That’s all for this week, but I’ll see you again next Monday with our weekly Fan Feedback! Thank you so much for reading and have a great rest of your day.